Your child is in the midst of summer and hasn’t started thinking about the first day back to school yet. 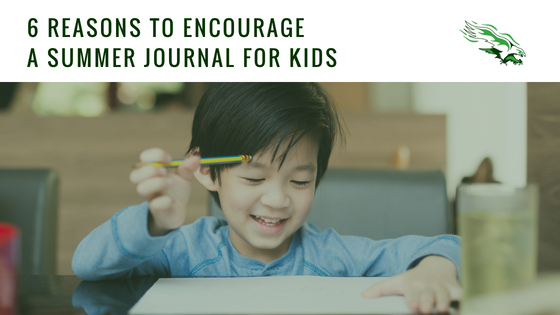 With quite a few days of summer still on the horizon, it’s not too late to incorporate journaling into your child’s daily activities. Here are 6 reasons that a journal is a beneficial addition to your kid’s summertime routine. The freedom of summer can be exhilarating and the thought of not going to school sounds ideal but what happens when your child has too much time on their hands? If your child starts to become bored with their summer routine, journaling is a healthy activity that is inexpensive and can be done anywhere at anytime! It’s a perfect indoor activity when the temperatures are too high for outdoor play. A journal can be a keepsake for your child in the future. Your child can enjoy looking back at what they wrote or what they did and it can remind them of wonderful memories. We capture fun times with a photo, why not describe what it was like or what their favorite part of the day was? This will ensure that special memories won’t be forgotten. A journal has been linked to decreased stress as it gives your child a way to express their feelings without judgement or extreme vulnerability. Writing down frustrations or emotions is a healthy way to get out toxic feelings. The distance and perspective (when looking back the next day) that a journal provides can help a child to act appropriately when dealing with a tricky situation. Stepping outside of the classroom during the summer months can stall your child’s learning and your child can even regress! Don’t let reading and writing take a turn for the worse over the summer. By journaling, your child’s academic aptitude can remain steady or even improve! Your child can work on their spelling, writing, sentence structure, thought organization, and topic focus, without it feeling like work. Your child will have more confidence heading into the next grade in the fall. Journaling can teach your kid how to develop a habit and can reinforce consistency and responsibility. For more structure, choose a time of the day that your child sits down and writes and bring it along to vacations and in the car for day trips as to not disrupt the routine. You’ll find that eventually, your child will be the one reinforcing the schedule. Summer is all about freedom and fun and that doesn’t have to stop at the pages of your child’s journal. Let your child experiment with no rules or limits. This can include writing, drawing, making lists or practicing cursive handwriting. If your child struggles at the beginning to come up with what to do, use writing prompts to spark an idea. Don’t forget to decorate the outside with stickers, magazine clippings or markers. Whether it’s indoors or outdoors, sitting at a table or lying in the grass, writing in a journal is a summer activity that is appropriate for all ages- even parents! Journaling does not have to be a form of “homework” for your kid but is a creative art activity that your child takes the lead on. Let your child have fun with it and you never know, journaling might even turn into a year-long activity! Copyright © 2017 Hope Leadership Academy Charter School. All rights reserved.